Get Ready for The 100 Day Flexibility Challenge! 100 Day Flexibility Challenge, here we go!!! Again. To start things off with a bang, I’m making 100 day memberships $7, and 30 day memberships $4 up until April 1st! In 2014 I decided to get serious about my flexibility routine for 100 days each year, and I’m glad I did. The results from my consistency have been amazing…and each year I was halfway thinking I would be stagnant in progression. But, as with anything, all I needed was a little faith, a consistent routine, and lots of patience. Perhaps using hours to gauge progress is more accurate when answering the “time it takes to get results” question. With each challenge I stretched about 100 hours in 100 days. My schedule was roughly 4 days a week, 2 hours per session; sometimes more, sometimes less. I listened to my body everyday, when I was tired I rested, when I was hungry I ate nutrient rich food, and if I wanted to dance or pole, I just completed the consistent warmup and dynamic stretching routine. By incorporating this consistent routine before pole, I was able to get into the more flexible tricks with ease. When I’m not doing the flexibility challenge, I stretch probably about 1 hour per week in total, nothing to intense. Spending that much time on anything, you’re bound to make progress, right?!? Russian Split – November 2015 – After 2nd flexibility challenge. Consistency was key, a routine that starts with a good warmup and dynamic stretches are crucial to progression with no injuries. And that’s exactly why I made the flexibility challenge community, to share my routine. You’ll find my entire routine, that I have used for the past 2 years, plus my newest dynamic stretching routine! 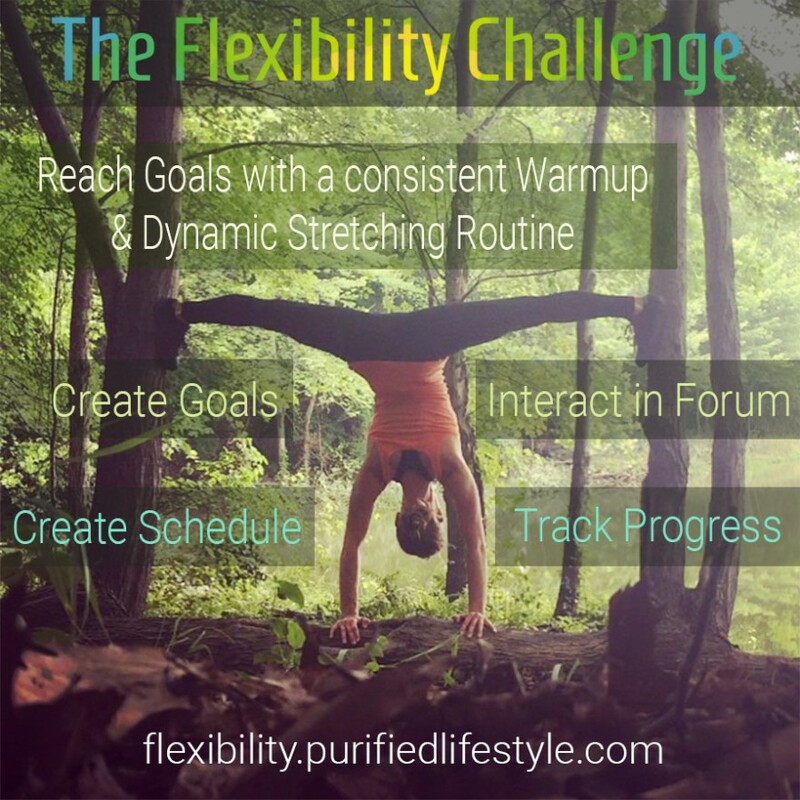 Check Out The Flexibility Challenge! stop focusing on what to do and start focusing on how to do. There are many techniques to apply to dynamic and static stretches; such as PNF stretching, my personal favorite. focus more on deep breaths. More oxygen, more blood flow, results in greater flexibility. focus more on proper form and posture. If your form is off, it can lead to muscle imbalances. Master the basics first, I’m still working on the basics 276 hours later, there’s always room for improvement. focus more on individually controlling muscles, by engaging and disengaging them with mind control. build muscle memory and habits that stick with you for better or worse. So make sure you practice with the above points in mind each session. You start off with a quick and easy cardio warmup, followed by a series of dynamic stretches. Both are in .gif format, like the one below, so it’s easier to follow and go at your own pace. After you complete the consistent warmup and dynamic stretching routine, you move on to static stretches. These are gathered stretches, in video or text and picture format, from my favorite stretchy people on the web. They have a lot of good advice, that I couldn’t say any better myself. Plus it’s good to get to know these people, they have tons of inspiration and different perspectives. Once you’ve finished the static stretches, you move onto your goals or core poses. You write out your goals in your profile section where you can also add your schedule, and assess your strengths and weaknesses. What Are The Core Poses? Static stretches support core poses, core poses are the foundation for many different tricks and variations; whether it’s in dance, pole, gymnastics or even contortion. You gotta know the ins and outs, the ups and downs, the lefts and rights and the all arounds in these core moves. Middle Split – knees facing forward. Straddle – knees facing up. Usually this is more than enough for a beginner, even if you’re not a beginner, you’ll still want to perfect these moves; and the only way to do that is with time and repetition. .GIF format Warmup and Dynamic Stretching Routine. Organized Static Stretches and Poses, featuring the best content from around the web. Profile – Add Schedule, Goals, Strengths, and Weaknesses. Post Progress Photos, Videos and the story behind it. Has it been a while since you’ve stretched? Maybe you’re still flexible and just not as pliable. A few days ago I posted about pliability vs. flexibility on Instagram and Facebook, I wanted to share it with you here as well. Gain flexibility with full stretching routines for middle splits, side splits, lower back, upper back & shoulders, handstands, and more!